HomeNo-buy Christmas rule #3: Have super mature, kickass children. Admittedly, this one might have taken some advance planning (i.e., trying to instill thoughtfulness in my kids since the day they each arrived in my life) and some “nature” that has nothing to do with what I like to tout as my super awesome parenting skills. I haven’t fully explained the no-buy concept behind our Christmas season to the kids. I’ve suggested that they make gifts for each other this year, and they’re completely on board with the idea, but they haven’t gotten the full-blown explanation that we’re really trying to buy nothing this season to cut down on stress and focus on that which really matters. And yet, last night at dinner, my eight year old threw her commitment onto the table with absolutely no prompting. Rhys: *gasp* Oh, Mommy! We need to write our letters to Santa so we can send them! Rhys: I’m going to tell him he doesn’t have to bring me anything if he doesn’t want to. He brings us tons of presents every year. He can take this year off if he wants to. Yes, she actually said that. On her own. Out of the blue. Music and books. 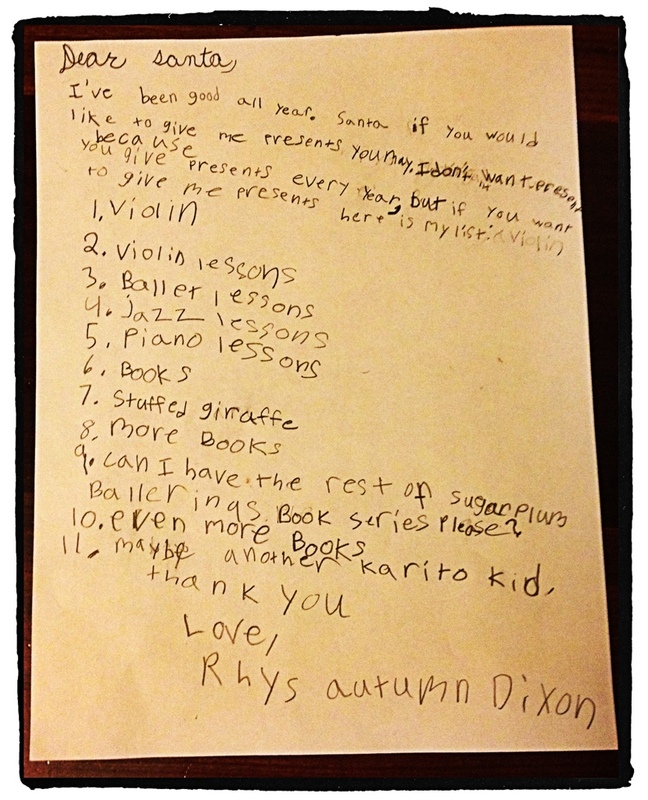 The kid wants music and books. A lot of music and books. And a stuffed giraffe and a doll. No-buy or not, how the hell is Santa supposed to refuse a list like that? Time to hit up craigslist, ebay, and the used book store. And if you happen to know anyone who will provide music lessons on a barter basis, please send them in my direction! ← No-buy Christmas rule #2: Invite friends over to make something beautiful.